Students and faculty have seen issues with the outdated infrastructure of the Warren M. Lee Center for Fine Arts (FA) for years, including the HVAC system, leaks in the ceiling highlighted by moldy ceiling tiles, acoustics and sound leakage, old water fountains and sinks that don’t drain. Faculty have begun to search for funds in what they estimate will be a $30 million project to address structural issues and complaints over-cramped space. In general, space is the main issue, with many of the FA’s 319 students and some faculty noting they need more classroom space, graduate studio space, storage space, faculty and graduate office space. A public forum for fine arts students was held last Wednesday by College of Fine Arts dean Larry Schou and SGA fine arts senator Kevin Huizenga, senior musical art major. One main topic of discussion included issues with the facility, which was built in 1973. Three fine arts students were in attendance of this forum held at 4 p.m. Huizenga said the low attendance was due to classes held at the same time. At the forum, Schou said it is a struggle to find donors that want to give to renovation causes. Schou said finding the donors can be frustrating and time-intensive. He said he’s been working on this project for years, and in the meantime, he’s had to focus more on fundraising for undergraduate scholarships. Raimondo Genna, chair of the theater department, said the reason facilities haven’t been updated is because fine arts are often overlooked. Genna said universities with strong arts, music and theater programs do better overall, and students at those universities are more engaged, and the university itself serves the culture of the region. Huizenga said the FA facilities don’t match the talent levels seen in USD students, which impacts enrollment to the College of Fine Arts. As the university sees increasing enrollment numbers and as the fine arts program has grown in the 45 years since the FA was built, departments across campus have been tasked with expanding their space and their resources. The theater department’s list of needs — besides larger faculty offices and storage space — begins with the Knutson theater, which needs upgrades in the lighting system, calling for a need to rewire the building, Genna said. Schou said at the forum that the black box theater needs to be twice as big, and the dance studio needs to be larger, as the dance minor grows. He and Genna have also said the Knutson theater and Colton Recital Hall both need new seats, as many of Knutson’s seats have been replaced through the years as they continue to break. Theater also needs a new painting frame, new pulley fly system, more performance classrooms, rehearsal spaces and graduate offices, Genna said. Theater has no dedicated classroom space beside the Knutson and black box theaters, and the dance studio. Most of the FA shares classroom 107, which also needs updated seats, Schou said. Huizenga said typically by the end of a semester, there are lines for the 14 practice rooms shared by the 107 undergraduate and graduate music students. One update that Schou is working on within the music department is updating two ship’s ladders — ladders that run perpendicular to the floor, not at an angle — to stairs. David Holdhusen, chair of music, said many walls in the FA were built with cinder blocks which were then filled with sand, which creates problems with sound leakage between rooms and doesn’t make good acoustic sense for many performing students. Holdhusen sits in an office in the music department neighboring many of the practice rooms. He hears music through his walls every day, which were meant to be soundproof. He said he has a pile of sand behind his desk where the wall has begun to leak. Some other items on Holdhusen’s wish list for building updates include Wi-Fi updates, equipment for recording and more storage space. The band and choir rooms are also housed right next to each other, which creates a hassle for performance and practice times. The visual arts wing of the FA houses many amenities in small, shared spaces. A laser cutter, large format printers, 3D printers and computers sit in one classroom altogether. A space intended for sculpture houses both a wood shop and a metal shop in one space, Knedler said. Upstairs, a space intended as a lighting studio doubles as a screen printing space. 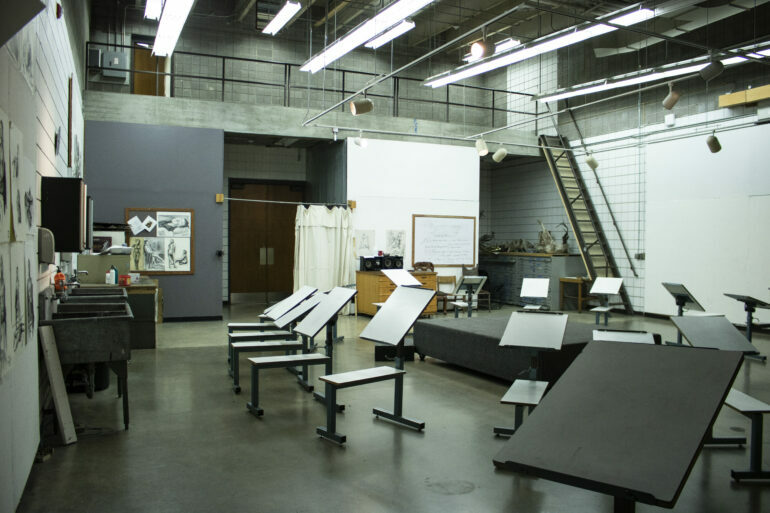 Knedler said many of the studio areas in the visual arts department have outgrown their facilities. One previous solution was to remove the graduate students’ studio spaces from their original location in the second-floor mezzanine above the drawing and painting room and push the graduate studios to Julian Hall. He said while graduate students are doing their best to work in Julian Hall, it’s far from the FA. Knedler said while Julian Hall functions as temporary studio spaces, he’s concerned about accreditation visits. This is a developing story, next week The Volante will look at ideas for future renovations and solutions to the space issues. Please reach out to volante@coyotes.usd.edu if you have any information to contribute to this story.